The floodgates have opened and out of them have flooded forth a tidal wave of Wood Elf rumory goodness! So far most of it has been good news, some of it has been exceptionally good news and a very small amount has been bad news. The aim of this post is to cover what we know, what we think we know and my views on all of it. So get a nice hot beverage, sit back and read on. -Wood Elves will have access to all 8 rule book lores in addition to the High and Dark lores with new lore attributes. -The forest spirit ward save will drop to 6+ but works all the time, otherwise the forest spirit rule stays the same. -Durthu is back! With a sword. So lets start at the top. The access to all 8 lores is great, no longer will Wood Elf players fear 1+ armour save, with access to the lore of metal all you need is a level 1 metal mage with the signature spell. And of course the idea of using death magic to hit a enemy unit with Soulblight right before unleashing a volley at them is very amusing, the possibilities are endless. Now the big news is that we gain access to both the High and Dark lores and the importance of this cannot be understated. Those lores are good on their own but combined in the same army they are exceptional. Walking a Treeman between worlds whilst hitting the enemy with Shroud of Despair will be something to watch. Turning back to High magic and we now have a way to deal with things like The Banner of the World Dragon, or the Banner of Eternal Flame. This is one of the best pieces of news to come out yet. Now for the one piece of news that isn't so good, the Forest Spirit Ward Save will drop to a 6+ but works against magic attacks as well as mundane. While i see what has been here (an attempt at balance) i don't think it was necessary because a making the ward save work against magic attacks didn't make the save of 5+ broken or even a little over powered. While i thank the design studio team for trying to be balanced i don't think it was needed and will probably make the ward save next to useless. Just quickly on ASF, its great that we got it and this rule combined with a few other rumored tweaks to existing units means that said units become viable again, notably the not-going-anywhere Eternal Guard. 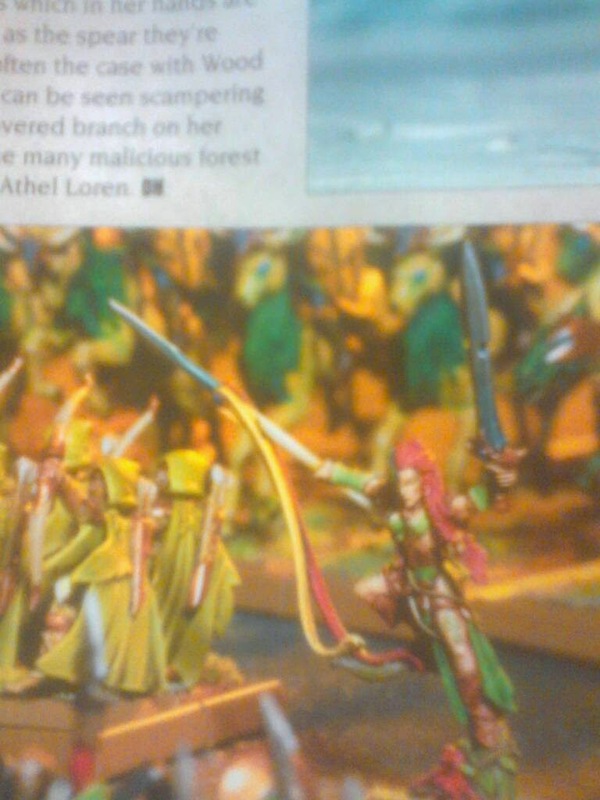 Durthu (whose model makes for a excellent Exoditie Eldar Avatar) is back with a sword. It turns out that the Durthu was so angered by the damage done to Athel Loren that he asked the Wood Elves for a weapon to smite his foes and so they made him a really big sword. Rules wise he is fun. He has WS:7, and S,T,W,A 6. In addition to this he has Scaly Skin 3+, Stubborn, Terror, Flammable, Frenzy and Blessing of the Ancients (no idea what this is at this point). 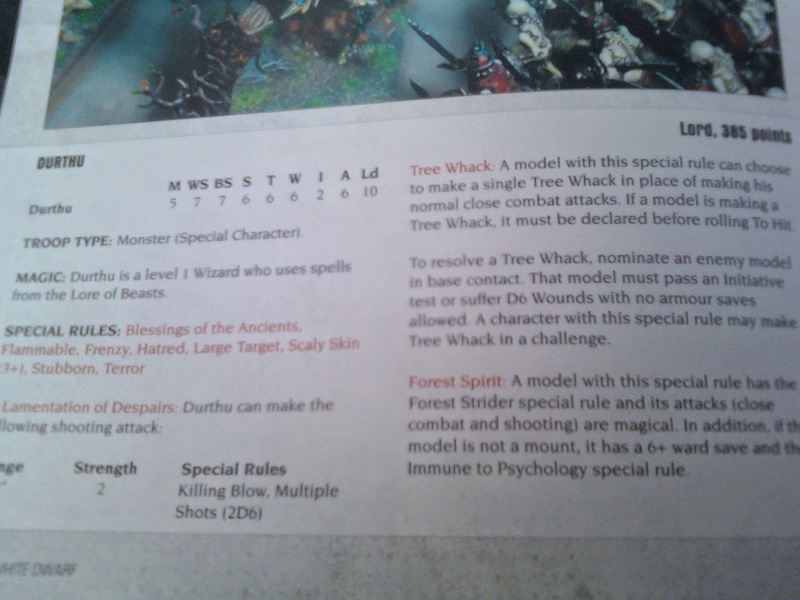 He also has a ability called Tree Whack, which is a big damage targeted attack at a single model in base-to-base contact, and something called a Lamination of Despairs which is a muitl shot 2d6 strength 2 killing blow shooting attack, and considering Durthu is BS 7 (which means he can shot as well as an elf) this could be very fun. Oh he is also a level 1 beasts wizard, so he can Wildform himself, yaay. Now the Stag Riders. Some shaped eyed people (including me) noticed these guys in a photo of the Shadowdancer hero. Now looking at that blurry image i can make out that they are on a standard cav base, so no Monstrous Cavalry. What is more likely is that they are the new mounts for wild riders as the stag is a favored animal of Kurnous and the wild riders are effectively his priests. So that wraps up what we know, now onto what we think we know. -The Wood Elves "Prowess" allows them to re-roll 1s to hit for all shooting attacks made with magic and non magic bows. -Army wide rules include: The aforementioned unnamde Prowess, Hatred Beastmen, Forest Strider, no penalty to move and shoot with bows, and all bows both magical and normal add +1 strength at half range. The Prowess is no big surprise and will be a nice addition to Wood Elf Armies (as now all Wood Elf armies will have some sort of bow based shooting). Hatred Beastmen is nice and fluffy and encapsulates the Wood Elves secret war with the Beastmen in one nice, not over powered rule. Now the release schedule is nice and shows sign that GW learns from its mistakes (notably the Dwarf release where Dwarf players had to wait 3 weeks into their release for the book). Having the army book come out week one keeps us Wood Elf players happy and allows us to make informed decisions when it comes to buying the new units because we will know what they do before buying them instead of buying blind. It is good to hear counter rumors to the other rumors (quick disclaimer, i get a tax break every time i type "Rumor") that the Eternal Guard were going, and this time we get the added bonus of a rumored +1 strength weapon. Combine this with ASF and the Guard are back in my list. Waywatchers get the Wood Elf bow, YAAAY! And they get Killing Blow as well, even better. I think this means that they are back in and i look forward to see what other goodness they get. And finally frenzied wild riders is interesting, and with them (maybe) getting a plastic kit i may well try out a unit or two. At the time of writing (24/04/2014 9:26 am NZ time) that is about all the rumors for Wood Elves we have. 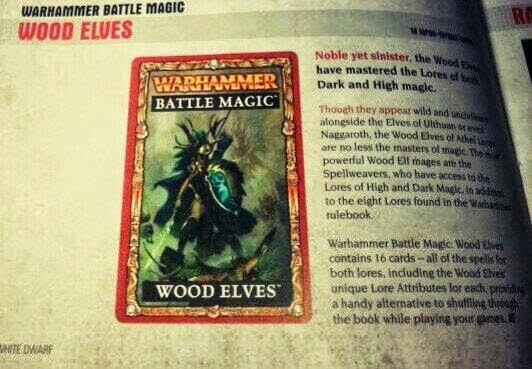 I am eagerly counting down the days to the 26th when i will be bale to buy the new (limited edition, because when Wood Elves get redone it pays to make the most out of it) Army book, expect a long a detailed review of said book and get as many games in against the current wood elves as you can, as of May they wont be so easy to beat. Until next time. Lvl4 Death, lvl2 metal 60+ archers in MSU set up + token combat stuff for when you need to claim the points= done. I dont think access to High and Dark magic will be game changing (unless the lore attributes are super awesome). Death is better than Dark and High magic is an odd fit for Elvish stuff.